Progress Report, 21 April, 10:45h. This has turned into a long list of everything I did wrong. I guess few people will want to read it all. However, we’ve distilled it into a page of advice on how, currently, to get your business on Apple Maps. Expect both that page and this post to change as Apple Maps develops, as I’m sure it will. We’ve now managed to claim two businesses on Apple Maps Connect: our own and that of a client. It hasn’t gone well. There’s just one thing left to do: remove a client’s duplicate listing. We’re waiting for Apple to do this. Apple Maps got off to a bad start when they launched it in 2012. Not only that, Google Maps already had an enviable reputation, so Apple users tended to download Google’s map ap and use that instead. However, things have changed. The latest version of Apple Maps is much improved and now there’s little to distinguish it from Google Maps, apart from personal preference. There are those, like ZDNet, who say it’s overtaken Google. It’s hard for Apple users to ignore. Even if you download Google’s ap on your i-Phone, Apple Maps remains the default. If you ask Siri for directions, Apple Maps always provides your route. With more than half of all searches being done on mobiles these days, every business with a local target market needs to appear on on-line Maps. This means you must either create, or find and claim, your business listing in their directories. Google is obviously the first one to tackle, as it is the most used. It’s also the easiest, as Google maintains its own directory of local businesses, called “Google My Business”. They’ve been running it for years, and the process is generally slick and problem free. If you haven’t done so already, read how to claim your Google My Business page. But with a projected 1.5 million new iOS devices due to hit the UK market this year, it’s worth the effort needed to claim your place in Apple’s business directory. Until quite recently, Apple has used a variety of sources for business data. These include Yelp, FourSquare, Booking.com, and a whole host of others. This meant you had to claim your listing in one or more of them to appear on Apple Maps. 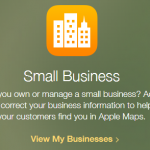 Now they have provided a way to get your business on Apple Maps directly. Getting BlueTree on to Apple Maps. This proved easy. Mark already has one. This was relatively simple, too. Just go to Apple Maps Connect and click the orange button. It asks you to enter some details and searches for your business. Since BlueTree wasn’t in the directory, it offered to let me create a new entry. This was quite simple, too. I won’t go into detail here because it’s cover in our advice page. But were we happy with the result? NO! This is what the top of our page looks like! Tucked down at the bottom right is a tiny message, “Photo from Yelp.” We’ve had a Yelp account for ages. 4. So How Does This Work? This is our logo, a square thumbnail, and the the wrong shape for this space. It does appear in our Yelp listing. There’s another image on there which is much more suitable. It’s roughly the right shape and it says something about our websites: they are mobile friendly. So, this raises a few questions. Can I change the image on the Apple Maps page? Did it take the image from Yelp because I hadn’t added one when I created the page? The logo was the second image loaded onto the Yelp page; would changing the sequence on Yelp fix the problem? And what’s the best size for the image anyway? Don’t bother to try and change the image on Apple Maps; you can’t. I didn’t upload any images to Apple Maps, and I can’t remember if I had the opportunity. I’ll ask a customer if I can claim theirs to check it out. Try changing the sequence of the images on BlueTree’s Yelp page. Well, the first thing I notice is, you can’t change the sequence. I’ll have to delete them and re-instate them in reverse order. Here goes. Oh dear! I can delete the image I want to use, but not the logo image. Maybe that’s because it was the first uploaded, or perhaps because it’s used by Apple Maps? Looks as though that’s the end of the road. We have permission from a kind customer, Force 9 Business Solutions, in Quedgeley, Glos. We recently converted their site to use our ezeSite CMS, and now we’re in the process of revamping it. Force 9 don’t have an entry in Yelp, so maybe we’ll get to upload our own images? We didn’t. Should this process not work, you get the opportunity to try again. And again. And again. The only snag (apart from the fact that it hasn’t worked) is that the time between retries increases. The retry time got past an hour before I gave up. In a typical software-developer way, they don’t help; just let you waste loads of time guessing. Did I type the number incorrectly? Does the phone number match the one on their website? Did our office staff miss the call? Does Apple’s system just not work sometimes? Eventually, the penny dropped! Force 9 has an 0333 phone number. This is non-geographic, and that’s not allowed (although it is; explained later). To prove this, I changed their phone number to ours, at BlueTree. That validated immediately, so the system does work. I submitted the page for authorisation. However, that proved to be a mistake, too. 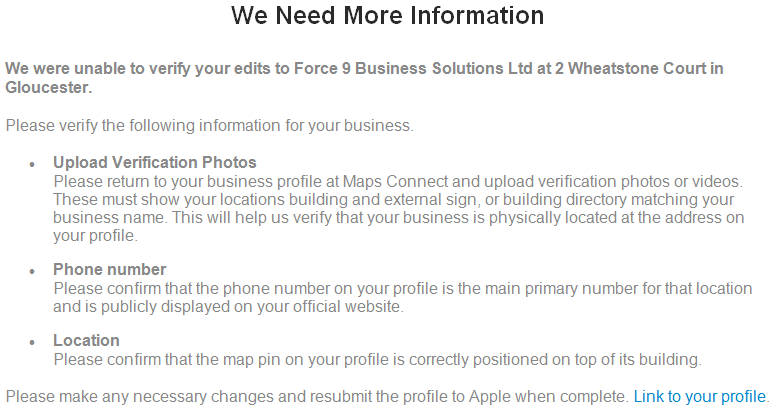 Obviously, the phone number no longer matched the the one of Force 9’s website. I corrected it, back to the 0333 number. After searching around, on of the Force 9 guys found an old office photograph that we’d used on an earlier version of their website. It showed the front door and the plaque next to it with their name on it. I also opened the map as if to move the pointer. That seems to cover the points they raised. After six days the authorisation arrived. Now, if you go to Gloucester, and ask Siri to take you to Force 9, up will come their page! Unfortunately, that’s not the end of the story. I asked one of F9’s directors to search Apple Maps using his i-Phone. Despite the fact that Maps Connect didn’t find it earlier, Force 9 now has two listings! First the new listing that I created. The other, with the wrong address and the map pointer in the wrong place and an old phone number, has obviously been there a while. We’ve requested that Apple deletes the incorrect entry, but nothing’s happened yet … after three days. The optimum size for Yelp’s images is 650 pixels wide, 410 high. It crops a square thumbnail out of the middle, horizontally, so it uses a 410 px square in the main display. Apple’s main image seems to be 798 x 250 pixels. It expands or shrinks the Yelp image to fit. You can’t control this process. I didn’t claim Force 9’s Yelp entry so Apple Maps would use its default image. This turns out to be an satellite picture from their map, with Force 9’s pointer dead in the middle. NB: make sure you get the pointer in the right place! As you can see, it’s far from ideal, as the huge warehouse next door dominates the picture. It would appear that this process is still under development. Google’s process is far slicker, and you get to control it far more. Apple is not competing yet, so expect the process to improve over time. It’s still worth claiming your Apple Maps listing, should you be allowed. The number of new Apple devices being sold, and the rising popularity of mobile search, make it a no-brainer. Once you’re listed, they’ll no doubt announce “major improvements” to the process as they catch Google up. 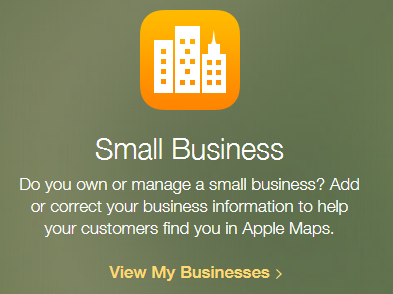 To avoid making the mess of it that I did, please read our help page, “How to Get Your Business on Apple Maps“. Good luck! This entry was posted in Digital Marketing and tagged apple maps, Yelp on April 4, 2016 by Dave Fielden.